During my CCIE R&S studies (CCIE Routing and Switching v5.0 Official Cert Guide, Volume 1), I have discovered an unexpected behavior of the static port channel: a Layer2 loop! Obviously, in order for that happen, several things must happen. 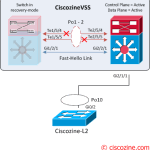 The Ciscozine-ROOT switch, as the word suggest, is the root bridge (priority 4096); the Ciscozine-ROOT_SEC is the “backup root bridge” (priority 8192), while the Ciscozine-SW has the default priority. the ports on the Ciscozine-ROOT_SEC switch toward Ciscozine-SW have already been bundled in a Port-channel using mode on (without Pagp or Lacp protocol). the Ciscozine-SW has no yet configured a port-channel toward Ciscozine-ROOT_SEC; the interfaces are two independent trunks. What will Spanning-tree do in this case? 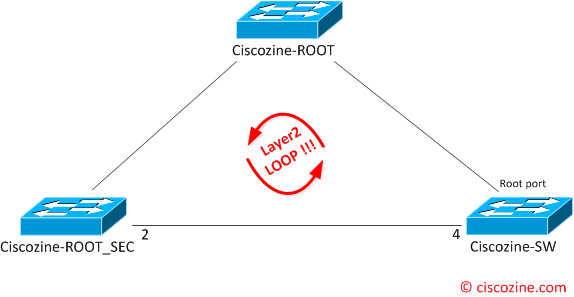 The Ciscozine-ROOT is the root bridge; for that the two interfaces are designated. 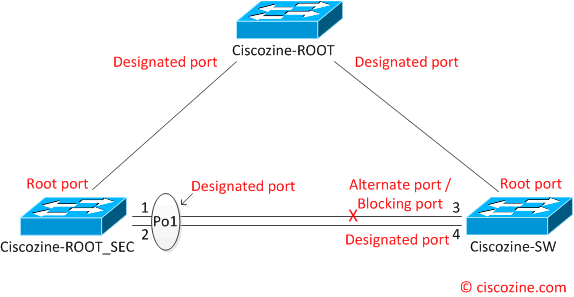 The Ciscozine-ROOT_SEC and Ciscozine-SW interfaces toward Ciscozine-ROOT switch are root port. 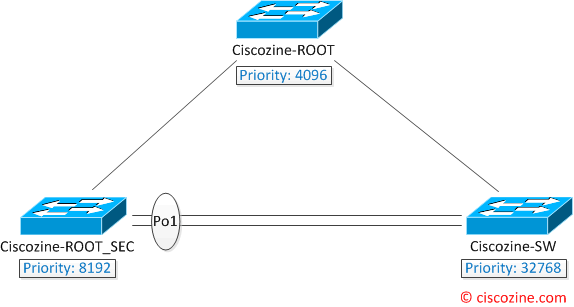 And what happen to the interconnection between the Ciscozine-ROOT_SEC and Ciscozine-SW? Because Port-channel interfaces are treated as single port by STP, only a single BPDU is sent for the entire Port-channel interface, regardless of how many physical links are bundled. 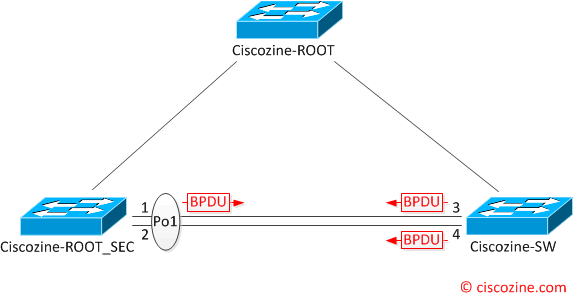 The #1 interface of Ciscozine-ROOT_SEC switch forward BPDUs and its neighbor interface (Ciscozine-SW interface #3) will set the interface to alternate (if it is used RSTP) or blocking (if it is used STP), because the BPDUs sent by Ciscozine-ROOT_SEC are superior, due the sender bridge id (priority 8192). However, the interface #4 of Ciscozine-SW is not receiving any BPDUs, so becomes “Designated forwarding” and a switching loop is created! Note: Even though such port (#4) sends BPDUs, they will be ignored by the Ciscozine-ROOT_SEC switch because they are inferior to its own BPDUs. STP (802.1D): a permanent switching loop is created! RSTP (802.1w): a layer2 loop is created but blocked by the dispute mechanism, a feature of RSTP and MST. How dispute works? If a switch receives a BPDU that indicates that the neighboring switch is going into a state that it shouldn’t, for instance, if a port receives an inferior BPDU that shows a port becoming designated Learning or Forwarding port (not a root port – an inferior BPDU can indeed be received on a port that should be a root port), then the port will move itself into a discarding state. In this example, the Dispute mechanism would detect this problem and put the Port-channel to the Discarding state, preventing this loop. Remember: The STP dispute mechanism doesn’t need to be configured or activated. Note: The Dispute mechanism is yet another and standardized means to detect a unidirectional link. For that, it is strongly recommended to use a dynamic negotiation protocol (Pagp or Lacp) to allow switches to negotiate the creation of a Port-channel and verify whether the links are eligible for bundling! During my CCIE R&S studies, I have discovered an unexpected behavior of the static port channel: the possibility of a Layer2 loop! Obviously, in order for that happen, several things must happen.